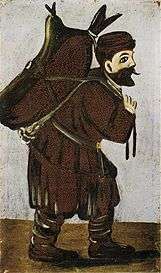 Man with Wineskin by Niko Pirosmani. New Wine into Old Wineskins is a parable of Jesus. It is found at Matthew 9:14-17, Mark 2:21-22 and Luke 5:33-39. And they said unto him, Why do the disciples of John fast often, and make prayers, and likewise the disciples of the Pharisees; but thine eat and drink? And he said unto them, Can ye make the children of the bridechamber fast, while the bridegroom is with them? But the days will come, when the bridegroom shall be taken away from them, and then shall they fast in those days. And he spake also a parable unto them; No man putteth a piece of a new garment upon an old; if otherwise, then both the new maketh a rent, and the piece that was taken out of the new agreeth not with the old. And no man putteth new wine into old bottles; else the new wine will burst the bottles, and be spilled, and the bottles shall perish. But new wine must be put into new bottles; and both are preserved. No man also having drunk old wine straightway desireth new: for he saith, The old is better. The two parables relate to the relationship between Jesus' teaching and traditional Judaism. According to some interpreters, Jesus here "pits his own, new way against the old way of the Pharisees and their scribes." In the early second century, Marcion, founder of Marcionism, used the passage to justify a "total separation between the religion that Jesus and Paul espoused and that of the Hebrew Scriptures." Other interpreters see Luke as giving Christianity roots in Jewish antiquity, although "Jesus has brought something new, and the rituals and traditions of official Judaism cannot contain it." In his commentary on Matthew, Mark, and Luke, John Calvin states that the old wineskins and the old garment represent Jesus' disciples, and the new wine and unshrunk cloth represent the practice of fasting twice a week. Fasting this way would be burdensome to the new disciples, and would be more than they could bear. Based on parallel rabbinic sayings found in Pirkei Avot, one interpreter sees the parable as depicting the difficulty of teaching disciples with prior learning as compared to teaching new, uneducated disciples. The metaphors in the two parables were drawn from contemporary culture. New cloth had not yet shrunk, so that using new cloth to patch older clothing would result in a tear as it began to shrink. Similarly, old wineskins had been "stretched to the limit" or become brittle as wine had fermented inside them; using them again therefore risked bursting them. 1 2 3 Joel B. Green, The Gospel of Luke, Eerdmans, 1997, ISBN 0-8028-2315-7, pp. 248-250. 1 2 3 James R. Edwards, The Gospel According to Mark, Eerdmans, 2002, ISBN 0-85111-778-3, pp. 91-92. ↑ Joseph B. Tyson, Marcion and Luke-Acts: A defining struggle, University of South Carolina Press, 2006, ISBN 1-57003-650-0, p. 32. ↑ R. T. France, The Gospel According to Matthew: An introduction and commentary, Eerdmans, 1985, ISBN 0-8028-0063-7, p. 169. ↑ Calvin's Commentary, Volume XVI, Baker: Grand Rapids, 1981, p. 408; also online. ↑ Lancaster, D. Thomas. "New Wine and Old Wineskins". Beth Immanuel. Retrieved 18 August 2016. ↑ Lancaster, D. Thomas (2014). Chronicles of the Messiah, Book 2 (2nd ed.). First Fruits of Zion. pp. 381–386. ISBN 978-1-892124-77-7. 1 2 3 Craig S. Keener, A Commentary on the Gospel of Matthew, Eerdmans, 1999, ISBN 0-8028-3821-9, pp. 300-301.